← And Here’s Wonder Woman! 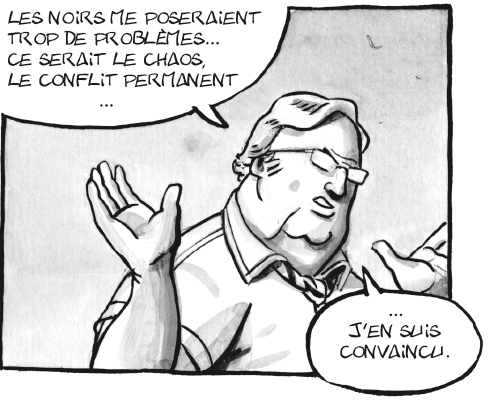 A New, French, BPP Graphic Novel! 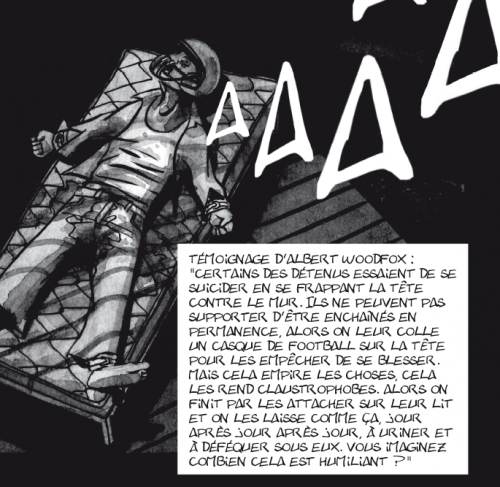 Amnesty International France and La Boîte à Bulles have published a 128-page French language graphic novel entitled Panthers in the Hole. 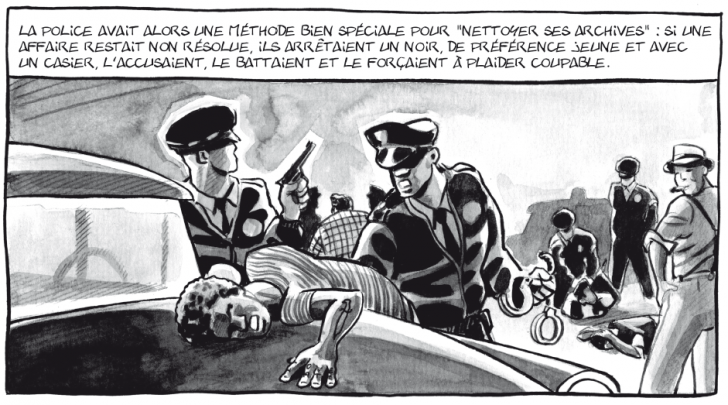 The book’s co-authors David Cénou and Bruno Cénou present with visual art what Amnesty France describes as “la tragique histoire des Trois d’Angola” (the tragic story of the Angola 3). Robert H. King, Herman Wallace, and Albert Woodfox are the trio of Black Panther political prisoners known collectively as the Angola 3. On October 1, 2013 Herman Wallace was dramatically released from prison after 41 years in solitary confinement. At the time of his release, he had been fighting terminal liver cancer for several months. Three days later, on Oct. 4, Herman was surrounded by loved ones as he passed on at a friend’s house in New Orleans, Louisiana. Albert Woodfox remains in solitary confinement to this day and with only temporary respite from routine body cavity searches pending an upcoming ruling by the US Fifth Circuit Court of Appeals. 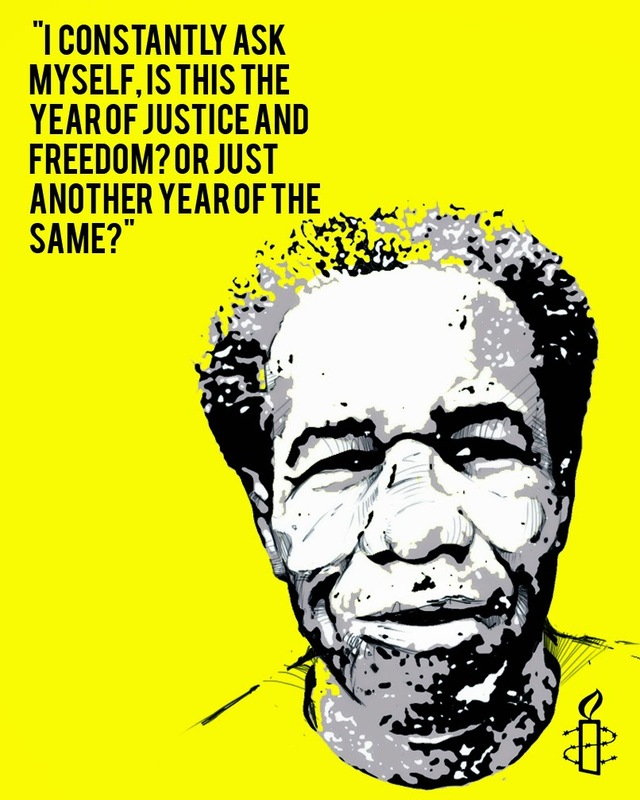 On April 17, 2014, marking 42 years since Albert Woodfox was first placed in solitary, Amnesty International renewed its call for his immediate release (view Amnesty’s statement and essay) and today continues their online campaign (sign the petition here). Robert King spent 29 years in continuous solitary confinement until his conviction was overturned and he was released from Louisiana’s infamous Angola State Prison in 2001. Himself the subject of a recent Canadian film, King spoke in Paris, France this past May at an event celebrating the release of Panthers in the Hole and has traveled Europe many times while on earlier speaking tours. 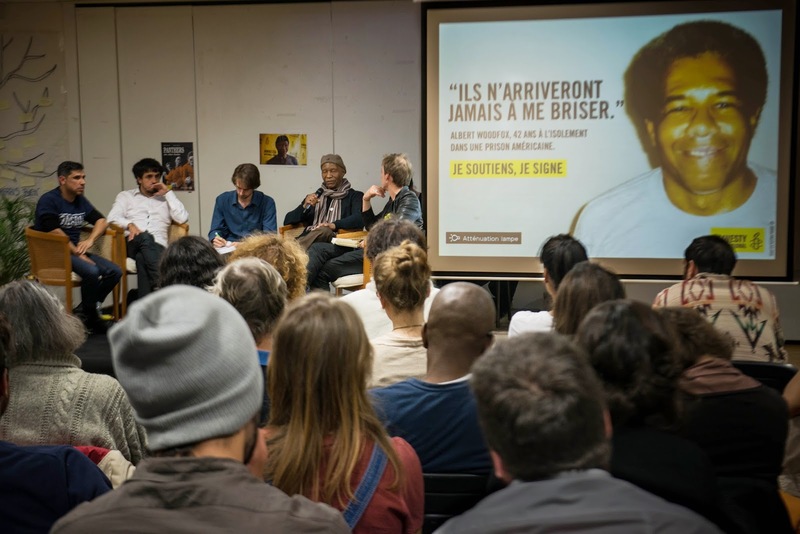 To further discuss the release of Panthers in the Hole and Amnesty France’s broader support for Albert Woodfox and the Angola 3, we interviewed Nicolas Krameyer, who is head of the Individuals at Risk / Human Rights Defenders Program for Amnesty International France. A sample of images from Panthers in the Hole are featured throughout the interview. Can you please tell us about your recent work related to the Angola 3? Nicolas Krameyer: Amnesty France has made the Angola 3 (A3) a priority campaign. We included Albert and Herman’s case as part of our biggest annual event, known as Write for Rights in December 2012. In just a few weeks, at least 50,000 supporters signed the petition for an end to their solitary confinement. We also organized a solidarity campaign where activists sent Herman and Albert messages of support. The letter-writers quickly received very strong and moving answers from Herman and Albert, which we then shared among other activists. 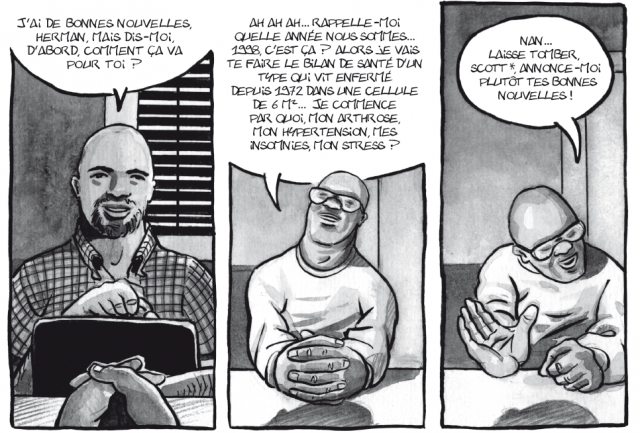 A few months later, we invited Robert King for a two-week speaking tour in France and Brussels, which gave national media coverage to the A3 and the widespread use of solitary confinement in the USA. Both the A3 case and the issue of solitary confinement were totally unknown to the general public. Even the partners and institutions with whom we normally work on human rights activism were not familiar with these issues. A3N: What do you think are the main reasons for the French public’s interest? (1) The monstrous nature of the case. There are very few examples in the world of such a blatant human rights violation for such a long period of time: more than 4 decades! (2) The audience could follow the different steps of the clear campaign of vengeance lead by the local Louisiana authorities, like when the prosecutor appealed Albert’s third overturned conviction, or in October 2013 when the State authorities did their most to impede Herman’s release despite his health. That clearly angered people here in France, and one indicator of this was that journalists were publishing articles every time something new happened, which is quite rare. (3) Lastly, this has been made possible because of Robert’s presence and strength, which he clearly communicated to all types of audiences, from the media to French officials and activists. A3N: Overall, how do you think Amnesty France’s A3 and anti-solitary campaigning has impacted France? NK: Previously, solitary confinement was not really considered a big human rights issue, except for some rare experts or USA specialists here. Guantanamo and death penalty continue to be the two main public topics in regards to human rights violations known in France. The A3 and Robert King gave a face to that common practice of cruel and inhumane treatment in the USA. Even if we can’t go into details here, we know that probably for first time, French and EU governments officially raised this issue with their US counterparts. 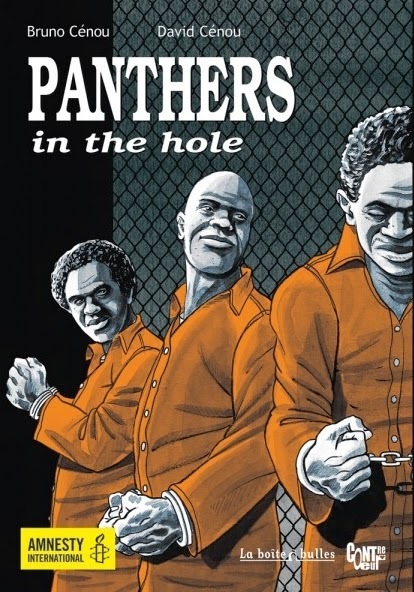 A3N: Can you tell us more about the new graphic novel, entitled Panthers in the Hole? How has it been received since being released in May? NK: The comic book gives the local historical context leading up to the A3’s horrific situation. The historic racism and the political context of the 60’s and 70’s is very present in the book. In short, the content is a mix between Robert’s autobiography and the documentary film In the Land of the Free. However, the authors have also read and researched a lot about Angola prison and the different trial transcripts of the three men. Visually, I really like how the authors recreated the atmosphere of the 60’s, which gives a special strength to the book. It is a bit as if In the Land of the Free had been covering the past 50 years of the story. Importantly, it also moves a different audience that is not necessarily familiar with human rights issues. So far, 2 months later, sales have been strong and feedback received from the editor suggests the book has been well received. A3N: With over 2.4 million prisoners, today, the US has the highest incarceration rate in the world. Do you think the crisis of mass incarceration relates to the widespread practice of solitary confinement in US prisons, especially considering that solitary confinement has been shown to increase recidivism rates? NK: Amnesty does not take a position on the incarceration rate a nation has. However, the widespread and routine use of long term solitary confinement in the US is not only contrary to international human rights law, as a clear form of inhumane treatment that amounts to torture. It also does contribute to recidivism because it greatly hinders the possibility for a rehabilitation process when the detainee comes out. In short, it is not only morally wrong, it is clearly inefficient, and also very expensive. A3N: As African American leader Malcolm X was developing his internationalist and anti-capitalist politics in the months leading up to his February 1965 assassination, he spoke about the need to shift from a focus on ‘civil rights’ to one of ‘human rights.’ He announced further that he would be seeking assistance from the United Nations to rectify the human rights abuses being committed by the US government against the African American community. How can international pressure influence a country as powerful as the US, who has openly violated human rights laws and treaties like at the infamous Guantanamo Bay and Bagram prisons that Amnesty International has criticized (http://www.amnestyusa.org/our-work/issues/security-and-human-rights/guantanamo) ? NK: I would say that the US’ power within the international community presents both a challenge and an opportunity for the international community, or as Robert King would say, the international court of public opinion. It is a challenge because many nations don’t want to confront the US on human rights issues. This is true even, and sometimes especially with ‘friends’ and traditional allies like EU countries. It is a shame how EU countries can adopt a double discourse on human rights that varies depending on the nation they have dialogue with. This is despite the fact that as friends and allies of the US, they definitely could use their influence more effectively than other countries. It is an opportunity because in order to maintain its power, the US needs not only to engage the rest of the world on military or economic levels, but also on what is called “soft power.” This means that for the US to still be considered a leading country, it has also to be recognized for the human rights record they have. Being isolated on human rights issues or other international issues, being regularly criticized within the intergovernmental bodies or in the international media, is not beneficial to the US as a nation, even if the US media or public opinion does not talk so much about these issues. That’s what happens in a way regarding the death penalty. Being one of the biggest executioners, with only very authoritarian regimes doing the same, is not good for the US image. A3N: Shifting focus to France, what types of human rights violations are you currently focusing on within your own country? How widespread are human rights violations in the French criminal justice system? 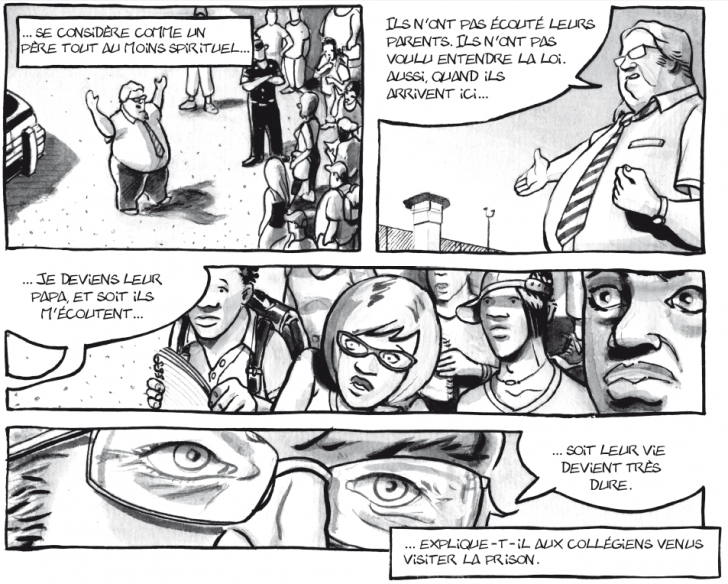 To what extent is prolonged solitary confinement used in France? NK: The main human rights violations that we as Amnesty oppose are not in the criminal justice system, although it is clearly not perfect: from what I know from other expert NGOs on the matter, prison conditions in France are a real shame and are regularly criticized by international bodies such as the European Court on human rights. Impunity for excessive violence or abuses committed by police officers is also a great matter of concern in France. However, the main issues we as Amnesty have to tackle right now in France, and more generally in Europe, are the rights of migrants. Today in Europe, borders are clearly more important than people’s lives and this policy results in massive human rights violations, including right to life, with migrants dying in the Mediterranean Sea or being held in inhumane detention centers just for trying to escape the problems in their country and for wanting a better life. Another key focus of ours relates to the discrimination faced by marginalized groups like Muslims and above all, rights of Roma communities. A3N: As activists, we can often learn important lessons from other communities’ struggles for justice around the world. Based upon your work and victories in France, what is your advice for human rights activists in the US who are working around prison issues? NK: It is a very hard question, but I would recommend inviting activists and specialists from other countries and other contexts to share their best practices and experiences with US activists. This helps to see the common aspects of the fight and what worked well. It also helps to identify what is specific to your own local context and what therefore has to be addressed specifically in your community. –Angola 3 News is a project of the International Coalition to Free the Angola 3. Our website is www.angola3news.com where we provide the latest news about the Angola 3. We are also creating our own media projects, which spotlight the issues central to the story of the Angola 3, like racism, repression, prisons, human rights, solitary confinement as torture, and more. This entry was posted in american history, books, cartoon, comics, news. Bookmark the permalink.